This view of the Oregon Electric Depot in Beaverton shows Laura Walker Olds waiting in a two-seater buggy, circa 1912. The Tualatin Valley and Beaverton area was originally the home of native people who referred to themselves as Atfalati. Westerners later mispronounced the name as Tualatin. The tribe was a hunter-gatherer group that relied more on plants than animals for their food. They made use of various plant materials for making their clothes, houses and other personal effects. Although prosperous, the Atfalati population declined significantly starting in the late 1700s. The Native Americans occupied a village located on the Beaverton and Fanno creeks that was called Chakeipi. Although the name meant “place of the beaver,” early settlers called the village Beaverdam and later changed it to Beaverton. In May of 1845, the Hall Family (natives of Kentucky who lived in Missouri) began their trek to the Oregon territory. The wagon train they were a part of tried to shorten the journey by taking a little explored trail, and encountered illness, battles, a dwindling water supply, and numerous deaths. But the Halls made it. Hall Boulevard in Beaverton is named after this pioneer family. In the spring of 1847, the first land claim (comprising 640 acres of Beaverdam) located in what is now Beaverton was taken up by Lawrence Hall. He and his brother built a grist mill near present-day Walker Road. Their mill along with others that were soon built in the area was instrumental in supporting Oregon’s early agriculture communities. The other important industry in early Oregon was logging and wood products. Thomas Hicklin Denney and his wife Berrilla came to Oregon in 1849 and quickly established the first sawmill in what is now the Beaverton area. Their first stop in Oregon Territory was Mills (Milwaukie). There they met Augustus Fanno, who told them about a fine section of land that adjoined his in the lush Tualatin Valley. Thomas thought it was a good piece of land, and by 1850, the Denneys had moved into a three-room log house on their claim, near what is now Scholls Ferry Road and Hall Boulevard. The newly completed Oregon Electric Depot in Beaverton in 1909. Developing a system of roads became a priority in 1849, and by 1850 the Portland-Tualatin Valley Plank Road Company was chartered by the Territorial Legislature to build the Pacific Coast’s first plank roads. As more people came into the area, it became increasingly important to provide a system of roads to transport agricultural and wood products to Portland for shipment. Plans called for the road to start in Portland and go out to Hillsboro along the wagon-beaten dirt trail called Canyon Road. Building came to a standstill when the company went bankrupt. Then in 1855 efforts were renewed. Public subscriptions were sold to raise money and a toll was charged for passage: from $1 to $5 for a wagon and team, with additional fees per head for loose livestock. 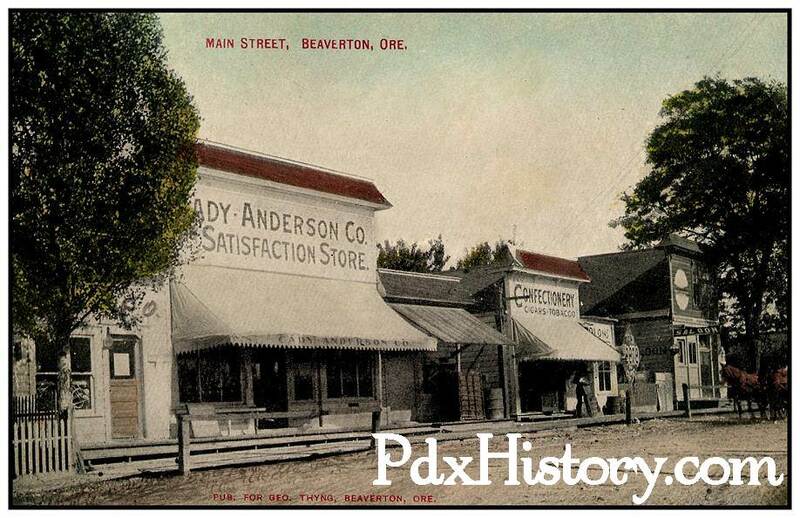 By 1860, Canyon Road to Beaverton was complete, boosting the economic success of Beaverton farmers and merchants. Spurred on by a railroad into town built in 1868, the small farming community west of Portland began to grow. In 1872, George Betts became the city’s first postmaster. The post office was located in a general store that he owned. The current post office is located on Betts street, named in honor of the first postmaster. Francis Marion Robinson graduated from Willamette University in 1885 with a degree in medicine, and started a practice in Beaverton. In 1887, Dr. Robinson had a Queen Anne-style, Victorian home built on Broadway. In 1893, he had a pharmacy built next to his residence. Today the former Robinson house and pharmacy have been combined and converted into the popular Beaverton Bakery which was established in 1925. 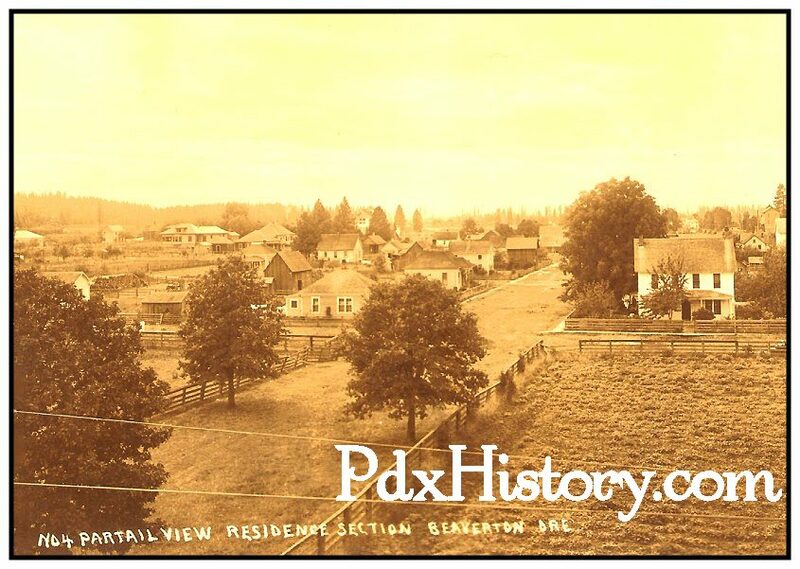 Residential section of Beaverton circa 1912. 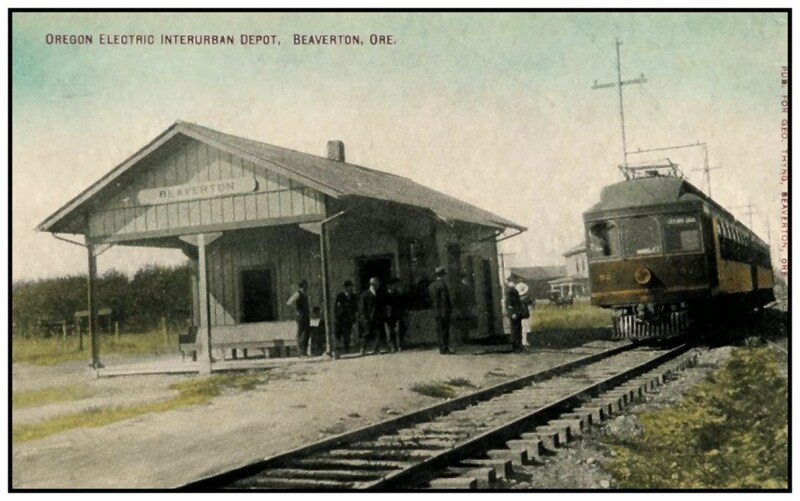 The completion of the railroad from Portland to Beaverton in 1870 was a catalyst for the incorporation, or legal formation of the "village of Beaverton”, although it didn’t officially happen until 1893. Alonzo Brockway Cady settled in Beaverton in 1892, bringing his family boot and shoe business with him, and in no time was the town’s leading merchant. 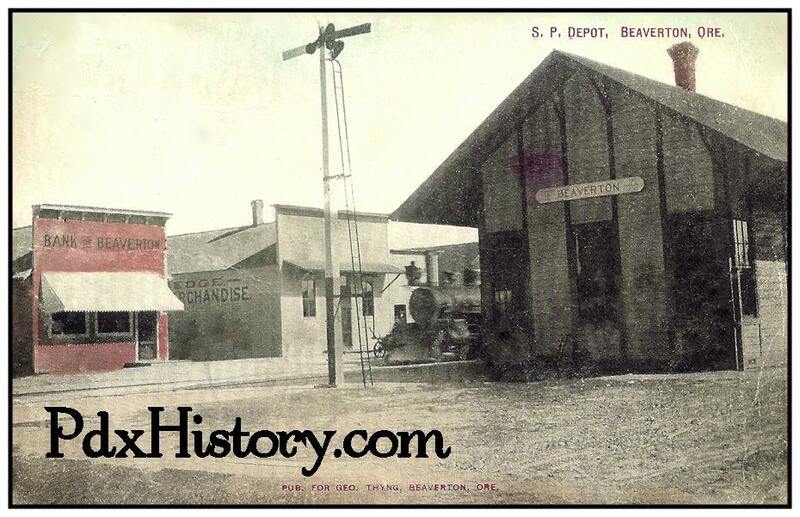 By 1893 the City of Beaverton was formally incorporated with a population of 400. Alonzo Cady, became the first mayor, shortly after the town was incorporated. This view of Front Street (now Farmington) in Beaverton from 1910 shows the original Bank of Beaverton on the left, a store in the middle, as well as the Southern Pacific Depot on the right. The popularity of bicycling by the early 1900’s prompted the Beaverton City Council to create a special speeding ordinance: If a person or persons operated a bicycle at a speed of greater than eight mph the fine would not be less than $10 and not more than $50. If the violator couldn’t pay, he was looking at time in the town jail for not less than five days or not more than 30. The Bank of Beaverton, the town’s first bank, was founded in 1910. In 1923 a new Spanish colonial building was constructed on the corner of Farmington and Watson. The present-day occupant of the 1923 bank building is Arthur Murray Dance Studio. This view of Main Street in Beaverton from 1909 shows the Cady-Anderson Store on the left as well as the Saloon on the far right. In 1912, the ladies of the Beaverton Grange wanted to help pass the Oregon vote for Woman’s Suffrage. All the men were summoned to the Grange Hall to vote on the issue, some traveling a long distance by horse and buggy. The ladies had a sumptuous potluck dinner waiting, and while the men enjoyed the meal, the women pleasantly suggested that the men vote in favor of the female gender. One German man shouted “I vote for the Vimen!” and the others followed suit. In 1915, Otto Erickson opened Beaverton Garage, the first automobile garage in town, with a capital investment of $3,500. Later that year he became Beaverton’s Ford agent. In 1917 he added Hillsboro to his territory and by 1918, he was the Ford agent for Washington County. By 1920, that $3,500 investment had grown to over $96,000. Otto was president of the company and owned 80 percent of the stock. The other 20 percent was shared by his employees as a reward for faithful service. Guy Carr arrived in Beaverton, in 1919, just after World War I. His step-father, Otto Erickson, was mayor at the time, in addition to owning the Ford dealership. Carr went to work for Erickson, demonstrating the Fordson Tractor (“A tractor was new, unheard of,” remembered Carr) and later assembling the Fords that were shipped in parts to the Beaverton Garage where he worked. In 1923, Carr bought out his step-father’s Ford dealership at the Farmington location, and sold Fords until the building burned in 1930. Guy Carr served on the Beaverton City Council for several years. 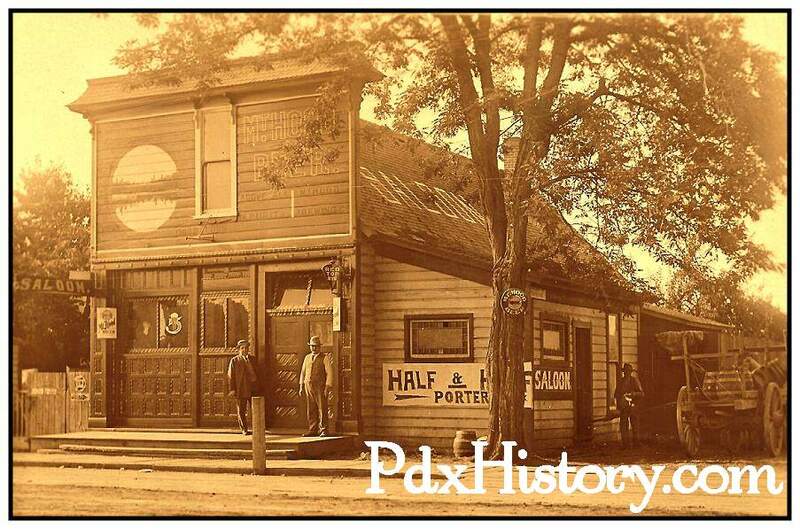 The Beaverton Saloon as seen in 1910 had no less than four signs advertising Mt. Hood Beer. The glamorous and exciting world of motion pictures changed the face of Beaverton in 1920, when Premium Picture Productions built a movie studio near Erickson Street. Local residents frequently worked as extras or had small walk-on parts. The film company made about 15 motion pictures before it went bankrupt late in 1925. The busy intersection of Southwest Allen and Hall Boulevards is the location where early Beaverton resident Orrin S. Allen lived. Allen was said to be scholarly (a faithful reader of the New York Tribune) as well a carpenter and painter. Beaverton had become the second busiest metropolis in the Portland area.